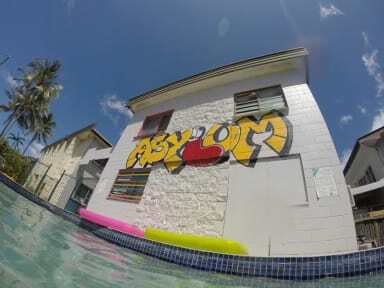 At Asylum Cairns, you're free to chill out by the pool and our front gardens. We provide free airport pickups, free high-speed WiFi, USB power to every bed (in selected dorms) and we are the one of the only hostels that allows you to BYOB! At Asylum you're more than welcome to bring your own drinks! We even have a large fridge in the lounge area dedicated to your booze! Join us for an all-you-can-eat BBQ (with salads, chicken wings, steak and lamb chops) every Monday for just $5 and win goodies with our Trivia/Quiz on Sundays. Join the '''Party in Cairns'' (formerly Mad Monday or Pants Down Party!) during the week for $20 which gets you pizza, games at the hostel and then a pub crawl to four locations with 4 free “gifts'' and a good opportunity to party with new people! Asylum Cairns welcomes you with open arms. We make an effort to know each and every guest by name and ensure that you get to know your fellow-inmates. If you want to make friends, have fun and laugh lots, this is the hostel for you. Asylum Cairns is an old spacious hostel with a true backpackers feel. Go elsewhere if you want an impersonal hotel style hostel! 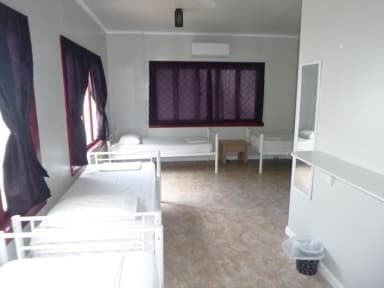 Asylum Cairns is not for the unsocial, clinical, sterile and those with way too much money. You will have loads of fun at the Asylum and save as much you can. It is a good place to make many friends. Do not come here if you are not social and wish to be left alone. The atmosphere is far from sterile and definitely suitable for first-time travellers who may find it hard to make that first move in making new friends. Heel leuke chille sfeer. Gastvrouw Annie is supervriendelijk. Zou hier zeker opnieuw boeken. Vriendelijk personeel. Wel wat luidruchtig publiek. Ligging verder prima. Geen gordijnen in kamer. Cheap, not very clean, lockers not working,staff very friendly.